Carville Duncan at the Georgetown Magistrates’ Court. 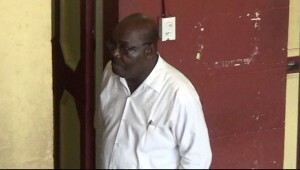 The President of the Federation of Independent Trade Unions of Guyana (FITUG) and the Guyana Labour Union, Carvil Duncan was Tuesday placed on GYD$1M bail in connection with three charges in his capacity as a former board member of the Guyana Power and Light. Police alleged that on March 31, 2015 at Georgetown, he stole GYD$984,900, property of GPL; on the same day at Georgetown, he conspired with GPL’s then Deputy Chief Executive Officer, Aneshwar Deonarine to steal GYD$984,900, property of the power company and that he conspired with Deonarine to commit a felony that is to say between May 7 and 8 at Georgetown he conspired to steal GYD$27,757,500, property of that utility company. Duncan was represented by attorney-at Law Mr. Charles Ramson Jnr, he told the court that his client has a credible defence and would not flee the jurisdiction since he has national ties with Guyana. Police prosecutor Deniro Jones did not object to bail and the case was adjourned to February 19, 2016. An arrest warrant was issued for Deonarine. The facts were not read in court, but the background to Duncan’s case is that Duncan allegedly approved the more than GYD$900,000 back-pay to himself for the 48 months he had been a GPL Board member. The payout was made although it is alleged that the board had merely considered increased the board member’s honorarium to be increased from GYD$5,000 to GYD$20,000 monthly. With regards to Deonarine, he managed to transfer the GYD$27 million dollars to his account, with Duncan’s assistance, as a retroactive increase from January, 2013 to June, 2015. Deonarine, who has been since sent on leave by the government, has left Guyana.